Christine Coombs Zoulias graduated from the University of Iowa in 1974 with BAs in Social Work and History. She moved to New Hampshire in 1976 after a year as a Vista Volunteer to work in the field of social work. After many years as the Welfare Administrator in Salem, NH, she joined her husband, Charlie in his company, Perfecta Camera Corp. With Charlie and their sons, George and Zachary, at her side, she traveled extensively. 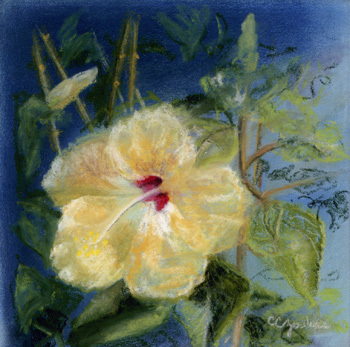 It was through the photography of these travels and her love of art that she made the leap to pastel painting. This allowed her to appreciate how light affects an ever changing landscape and creates the challenge of catching the moment in a painting. Of her work, Zoulias writes, "For the past five years, I have created pieces which deepen the memories of my travels. Each landscape painting allows me to feel and relive the scene, whether it is Greece, Martha's Vineyard or the wilds of Alaska. Through the careful instruction and encouragement of Linda Obremski, Sue Zylak, and Mary Buergen, my creative side has been heightened by the challenge of each painting."